Just wanted everyone to know that NXT Pro 2, has the same issues as NXT 2 does when trying to create a DVD. It does not recognize the black disc in the drive. I purchased new Dell XPS 8700 in October 2013, Manufacture and model of drive is HL-DT-ST DVDRWBD CH20N. Firmware Revision A201. When opening the program and going to tools, selecting get disc information it will show the blank disc in the drive however when trying to create a disc it says the drive is empty. I contacted Roxio support yesterday Dec 1, 2013 and informed them of the problem. There response was that my 14 day warranty period had expired and that I needed to open a paid support ticket. Obviously they are unable to count either as I purchased the physical product Nov 21 and received and registered it on Nov. 26, 2013. I received my support code on that same day welcoming me to my 14 day warranty period. I copied and paste both emails in to my support ticket for whoever is assigned to my case but am not hopeful about any results since I have read other posts here in the forum. Oh, how I wish I had came here and read about the issues before I purchased. Needless to say I am furious, not necessarily about the bug with the software, but more so because of the response I received. I can not believe that they would even suggest a paid support ticket when they know there are problems with the software not to mention the fact that I was on day 5 of my warranty. I plan on calling them tomorrow if I have no response but I wanted to post this for anyone who is thinking of purchasing to beware. Though I purchased the software while it was on sale, $100.00 is a lot to pay for something that isn't worth $1.00. I wish you well with your request from Support. Any miserly 14-day period should start when you receive the product, but even starting from the 21st there are a couple of days to run yet. I think you missed a vital piece of information, your Operating System. I've not heard of this happening to anyone running a 32-bit operating system, yet. Are you running a 64-bit something? The work-around is to 'burn' to an image, and then burn that to disc. Shouldn't be like that, though. Thanks for your help Brendon. I did receive a response from support today, Their worthless warranty is only for activation and installation problems, if you have any other problems you have to buy a support ticket, UNBELIEVEABLE!! Could you please explain to me " Burn to an image and then burn to disc"? Sorry, to be a pain but you are the only person with a sympathetic ear that has responded. I don't have much experience with burning DVD's. Windows 8 or 8.1? Do you have Roxio burn enabled? I don't have this problem in W-8 x64 Pro using NXT Pro or NXT2 Pro! From the pic below unckeck the Burn to disc and in the middle check save disc image file. I am quite lost for words. I meant "Save disc image file". You uncheck the "Burn to disc" box and check "Save disc image file'. That creates an .ISO image file on your hard drive, and you can burn that to a disc with other parts of the Roxio suite which still recognize that a blank disc is in the drive. Windows 7, yes burn to disc is checked, but it still says drive is empty. Brendon, I assume after saving disc image that I will have to burn from Copy and Convert section, correct? 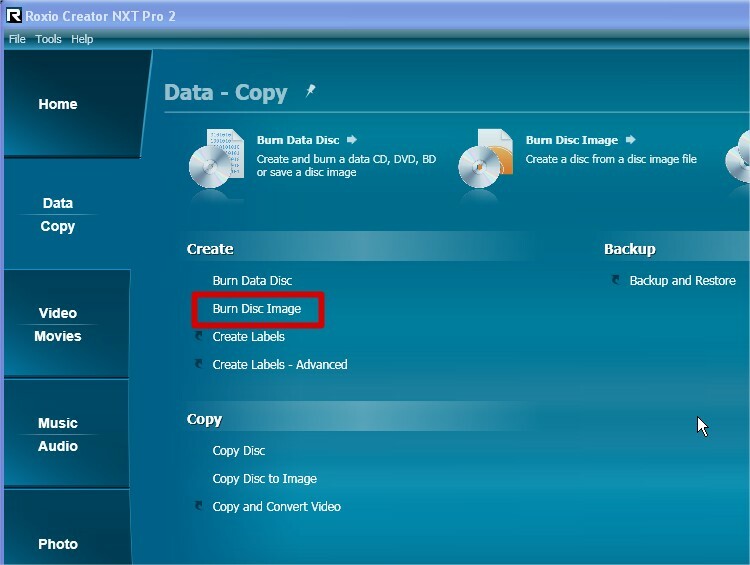 Burn Disc Image is better, since it assumes all the manipulation is done already and just burns the image to disc. Thank you for your help Brendon, I was in fact able to burn after creating an image file. If you don't mind I have another question and would like your advise on another subject. Question - After burning DVD will it play on a regular DVD player if the original file is in AVI or MPG4 format? They seem to play fine on my BluRay Smart player but would like to make copies for my brother and he just has a regular player. Advise - After I pretty much slammed tech support about their so called warranty they decided to try and help me, which I am totally grateful for. They requested a copy of my Dx Diag file which I sent they have determined that I have a combo driver ( DVD and BluRay Writer in one ). They want me to uninstall the DVD burner and try to see if it will correct the problem. I am terrified about doing this in the event that it doesn't solve my problem and if I mess up my driver. I didn't think that I had the disc to get it back but upon looking through my computer file I did find that I had a Drivers and Utilities CD. I am still skeptical and really wanted the advise of someone that knew a lot more about these matters than I do. Would you do as requested if it were you? Thank you for your kindness and sympathy on my quest to get things running correctly. There are two ways to put video onto a disc. -First way is to just dump it onto a data disc as an .avi or .mp4 file. It is just stored there in its original form and can't be played on a lot of DVD players. -the Second way is to process it through software like MyDVD or Video Copy & Convert to make a DVD-Video disc. This one should be playable on any DVD player. If you're not sure which sort you made, 'open' the disc with Windows. In a DVD-Video disc you'll see two folders - Video_TS and Audio_TS. The Video_TS folder has *.VOB, *.IFO, and *.BUP files. The Audio_TS folder will be empty, and some software doesn't even create that useless folder. If you see a folder named Video_TS you should have a Video_DVD readable in any DVD player. If they're asking what I think, yes I would. There's little point in paying consultants or experts or seeing a doctor if we don't take their advice, is there? Are they asking you to open Windows Device Manager, find your drive in DVD/CD-ROM drives, and then uninstall it and reboot Windows? When you install Windows, it installs drivers for all your peripherals including standard MS drivers for your optical drives so Windows can see the drives. When you install NXT, the program installs a Roxio driver in the same Windows registry key so that Roxio can see the drives. Is that what they're asking you to do? Thanks for your response again, Brendon. Yes, that is exactly what they are asking me to do. I have been out of town and am now able to do as they requested. It is scary to me though because it brings up my driver only ( HL-DT-ST DVDRWBD CH20N SCSI CDROM Device). Guess, it is my lack of computer knowledge, but it sure sounds important to me, LOL. They never told me that I would have to uninstall and reinstall my Roxio Software, so I have replied and asked that question before proceeding. If anything I have said sounds wrong, please let me know. No, I think you're doing well there. Please ask anything you need to know and if necessary I can try most things out for you. I have a sneaky system where I back up my system drive very quickly, and can then go and try out all sorts of scarey things. Once I've tried out something I can reliably restore the system inside 5 minutes, even if the experiment completely blew the mission. Yep, it's probably a bit off topic but if it's useful to the denizens here . . . . . I partition my hard drive so that my C: drive is really small, and where possible I install stuff so the bulk goes on other partitions. I use an old version of Norton Ghost [booted from a floppy] to make a bootable image of C: which I save somewhere else, and I do this quite often. I keep a week's worth, and overwrite the oldest image each time. On my XP machine, C: is about 3 GB of data so it only takes me 2-3 minutes to back it up or the same to restore it. In Windows 7 it's about twice the size, and in Windows 8 it's about 3 x the size. The backup is actually done from the DOS floppy but works quite well. I'm happy to answer questions or discuss this further, though we should probably take any prolonged chat to either a new topic, or else PM [Private Message] or email. I have been reading this thread about Nxt Pro 2 Not recognizing Disc in Drive. I am having the same problem with my brand new Dell 8700 i7, Windows 8 64bit machine. I purchased Nxt Pro 2 on Jan, 1 2014. Every where I look , it says I need a support code. Anyway, I was wondering if the advise that Harley-dreams received from support of uninstalling the CD-Rom diver in Windows, and then reinstalling, solved the problem. This program is basically useless to me if I can't burn my home movies to discs that play in my DVD Player. I can see I'm not the only one with this problem. Does anyone know of some sort of patch from Roxio? Thanks to anyone that can help. Still waiting to hear back from Harley-dreams. I don't think that trying on another computer is going to help or prove anything, since the problem only seems to happen on Windows 7 or 8 computers with 64-bit Operating Systems and perhaps particular types of drives. The program works fine on all 32-bit machines, and most 64-bit ones. I agree that it will not prove anything. Before my new computer arrived I installed the program on my wife's HP, Windows 7, 64bit machine. The "Burn to Disc" functions just fine. I would like it to work on my new, faster Dell. We paid good money for this program....If you come up with a solution, please let me know. Thank you both for your response. Brendon: Do you think stealing the drive from his wifes PC would be of any use for avnav??? To answer Harley-dreams---The CD-Rom installed on my new Dell is PLDS DVD+RW DH-16AES. I do believe it a problem with MyDVD seeing the drive. I tried the uninstall driver procedure without uninstalling Nxt Pro. Low and behold the "Burn to disc" option became active. I thought the problem solved, when it greyed out in about 15 seconds. I am not going to uninstall the driver every time. Nxt Pro 2 does not like the drive in my Dell. Does anyone know whether there has been a fix or work around for this problem? I have a new DELL XPS8700 with 64 bit Windows 7, and Roxio Creator NXT 2 does not recognize the DVD for burning either a project directly or and an iso image of the project. Once I have an iso image, I can use Windows 7 to burn it, and I get a working copy that way, but I really would like to be able to burn straight to disk. Does anyone have a list of DVD drives that are known to work with the 64bit Windows and Roxio? I have a Dell XPS8700, 64 bit Windows 8.1. I had the same issue as it appears several have had. NXT2 Pro would not recognize that I had a CD/DVD in my system. The following is the solution provided to me from Tech Support. It worked for me. Software is now fully functional. Good luck! Hope it workds for you! 7. Reboot your computer and reinstall Creator NXT Pro 2. *Note: If you do not find some of the folders listed above, this is okay, as long as you searched in the correct locations; this means that those folders have already been removed by the uninstall process. The procedures above is just to make sure that there are no left over files/folders so you can perform a "clean" install of the software.